Join Mystical Alchemy’s Heather Salmon and Donny Regal for a very special sonic journey into the Realms of Illumination! d by the sacred gates being activated in May and June 2012 this Mystical Alchemy will be informative, inspiring and empowering! Please join us for this rare San Rafael appearance at the exquisite Zen Healyng Sanctuary which is located right on the canal in San Rafael! Please RSVP in advance and receive a FREE Mystical Alchemy Download! RSVP — this event will sell out! One of the most inspiring light beings I know, Amoraea has been facilitating transformational experiences for over 10 years throughout the United States, and continues to share his ceremonies, visionary art & music to inspire and empower people to live from their God-selves, and make the Eternal Light of the Soul in each person more evident. 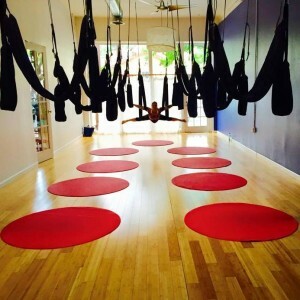 NEW AERIAL YOGA CLASSES IN SAN RAFAEL! So pleased to announce that Aruna and I are using a cute little dance studio in San Rafael to hold semi-private Fly Gym “Aerial Yoga Play” Classes (for 2-4 lucky folks). This is the best cleansing programing for a complete, full body experience! Cleanse your mind, body, and soul a fresh spring start. Look good, feel great, and boost your vitality by detoxifying the body for overall optimal health and Well-being! CONSCIOUS COMMUNITY GATHERING: CELEBRATING ARTISTS! We are available for special events, music and yoga festivals, birthdays, and grand openings. Contact us for more details and prices. JUNE 22-25TH: MOVEMENT PLAY! THE QUANTUM PLAYGROUND IS EXCITED FOR THIS FAMILY STYLE MICRO-FESTIVAL, ONE OF MY ALL TIME FAVORITES!! Come hang, stretch, and explore movement and play with us at this very special event in Willits, CA. JUNE 29- JULY 2ND: ~ENCHANTED FOREST~ THE QUANTUM PLAYGROUND IS HONORED TO BE INCLUDED IN THIS SPECIAL EVENT TO CELEBRATE JULY 4TH WEEKEND! Beautiful Mendocino location. Incredible Music, Art, and Dance! Make REAL positive change in your life in just 8-weeks through Empowerment Teachings, Superfoods, Cleansing, Exercise, “Flying Yoga”, ‘Quantum Healyng’ Bodywork, Spiritual Guidance, Meditation, and Time & Energy Management. Sign up by June 30th and receive the New Empowerment Course for FREE! THE QUANTUM PLAYGROUND EQUIPMENT TAKE HOME SPECIAL! Fly Gym Yoga Swings allow a combination of benefits similar to aerial yoga, pilates, suspended resistance training and aerial silks all rolled into one for an amazing suspended fitness experience. Sculpt your body in the air as you tone muscles and increase flexibility. Fly Gym aerial yoga combines the benefits of flexibility, strength and balance found in traditional yoga with the unique conditioning of aerial dance for an exhilarating new way to fitness. Fly gym yoga swings can be used in gyms, group fitness, yoga classes, aerial arts studios, sports medicine centers, martial arts studios, as a physical therapy tool, at home……. Physical therapists and trainers have told us that they are discovering that Fly Gym Aerial Fitness could be one fo the most effective tools they have ever used. The ability to suspend the body provides a unique advantage in rehabilitation creating one of the most beneficial ways of using gravity to accelerate healing better than traditional “table” approaches. Get inspired to take your practice to the next level! LIVE HEALTHY, WEALTHY, AND WISE in any and all areas of your life. Learn the tools and skills to create real success… find a thriving career that you love, have wonderful relationships that are fulfilling, experience optimal health. Regain health, happiness, and vitality through these empowerment teachings– these practicesREALLY WORK!! I have created these online empowerment courses exactly for this reason– they are convenient, affordable, and accessible. where you will learn the tools for greater health, wealth, and power. When you follow the recipe given above, you are *guaranteed* to live a better, more fulfilling life every day. Do something you love everyday. Say thank you often. Dance, Listen to great Music, or Sing out loud whenever you need a recharge. MOVE YOUR BODY– and have fun while doing it. Hang upside down and play more!! Do you love what you do for work? If not, make it as fun and fulfilling as possible on your way to living your dreams. If you do, celebrate every moment! Take time outs through out the day– recharge and rejunenate often with yummy healthy foods, getting outside in nature/sunshine, walks, and quiet time. Take time to do something kind for someone and look for reasons to feel inspired as well as ways to inspire others. It will uplift your spirit! Go to bed reviewing the new things your learned and what you are most appreciative for. Indulge in your imagination and allow yourself to dream big while you rest well. Go to sleep meditating and you will wake up feeling completely renewed and refreshed (see guided meditations for some inspiration). Are you ready for a real lifestyle makeover and need guidance?? My 8 week intensives are designed specifically to help you live your best Self! The Guided Meditation series are inspired from and influenced by the teachings of Abraham, Pleaidian Lightwork, Theta Healing, Melchizedek, and my own practice, Zen Healyng. The Guided Meditations are designed to clear and align the body on all planes of existence, through the chakra system, down to the cellular level. Releasing any and all holdings that are left over in our field from unprocessed experiences allows the highest intelligence and life force energy to pulse through us, smoothly and easily, once again, in alignment with our original sour matrix– spontaneously healing on levels. They are spontaneous and unscripted, specific to my clients needs. This collection is taken the from the Online Course Program. There are six Guided Meditations included. The six meditations available for download are Infinite Being, Multi Dimensional Reality (week2), Energy (week3), The Chakras (week4), The Power of Emotions (week5), and Choice & Love. Each meditation is approximately 30 minutes. The Path of Empowerment II Meditation Series is taken the from the second half of the Fall Online Course Program. There are seven Guided Meditations included. The seven meditations available for download are Healing, Quantum Healyng (week2), Sacred Sexuality (week3), Embodiment (week4), Choice & Love, Divine Love (week5) and FREE Sacred Heart Space. Each meditation is approximately 30 minutes. Guided Meditations are now available online for purchase! GIVE THE GIFT OF HEALTH & WELLNESS!